The majority of children in Detroit now live in poverty, says a new report from the demographic firm Data Driven Detroit. 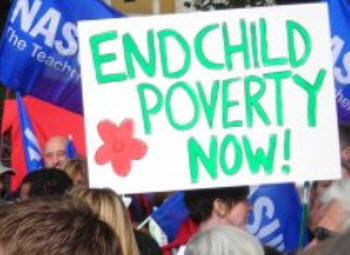 The child poverty rate was 57.3 percent in 2011, D3 found in “2012 State of the Detroit Child", after a decade of huge increases in economic struggles for children in Michigan’s largest city. “The large increase in the share of children living in poverty was the real story of the last decade,” stated Data Driven Detroit in a release accompanying the report. “Nearly 60 percent (57.3 percent) of Detroit children were living in poverty in 2011. This represents a 64.7 percent increase in child poverty since 1999, eliminating all gains that were made during the decade of the 1990s. The firm pointed out that the poverty rate was highest, 62.7 percent, for Detroit’s youngest children – those under age 5. In 2010, fewer than 3 in 10 Detroit children (28.9 percent) lived in households led by a married couple – down from 34.5 percent in 2000. In 2011, 41 percent of city households reported receiving food assistance. In 2011, nearly half the city’s working-age population (49.1 percent) was not working. While housing values fell in Detroit over the decade, housing costs for Detroiters rose between 2000 and 2010. In a city where nearly half the households rent, the average monthly leasing cost rose from $656 to $741 over the decade. Between 1999 and 2011, the percentage of Detroit children enrolled in Detroit Public Schools fell from 80.4 percent to 45.7 percent. In other words, the majority of school-age children living in Detroit attends classes elsewhere. “I find the changes in the educational structure -- the share of Detroit children by governance -- is particularly interesting,” said Kurt Metzger, who led the D3 team that created the study at the behest of the Skillman Foundation.